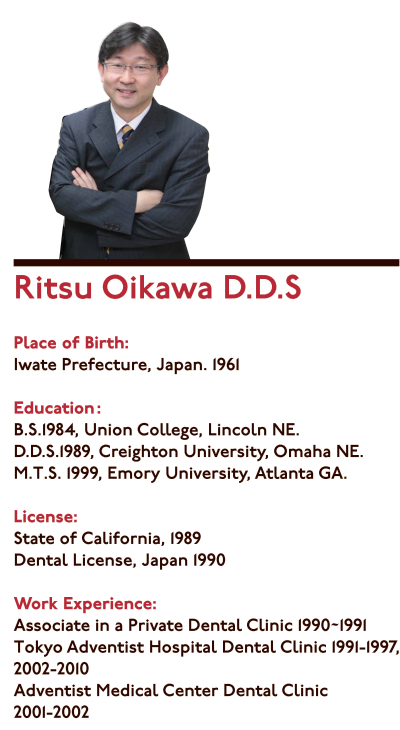 Dr.Ritsu Oikawa, the clinical director, spent his college and dental school years in Nebaraska. 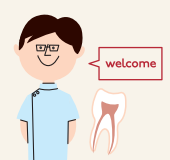 After graduating from Creighton University Dental School, he was licensed in California. In 1990, he passed Japanese National Board Exam and worked for a Japanese dental clinic where he saw over 30 patients on a typical day. The clinical environment was far from what he has taught in dental school. In 1991 he joined Tokyo Adventist Hospital, where he found the environment similar to an American practice. Although he was born and raised in Japan till he was 19 years of age, he speaks English very fluently and is often asked if he was "Nisei"(Second Generartion Japanese immigrants), or from Hawaii. At Tokyo Adventist Hospital where he was a director of Dental Clinic, he has placed and restored over 2000 dental implants. His area of concentration also includes Preventive, Oral Surgery, Restorative and Pronthetic dentistry. He characterizes his practice as "Conservative Approach". "New doesn't always mean good. Although it is very important to keep up with the newest, I have seen many new technologies come and go. Time proven techniques and materials are still the core of good dentistry." He spends his spare time buiding musical instruments. His completed works include two small pipe organs, four violins, two violas, and a viola da gamba.The most recent project is a Cello.